Sterling extended gains across the board as expectations grew that politicians would vote against leaving the European Union in 16 days time without an agreement. The British currency has swung wildly between $1.30 and $1.33 in chaotic trading over the last 48 hours, but found some support in evening London trading around $1.32. 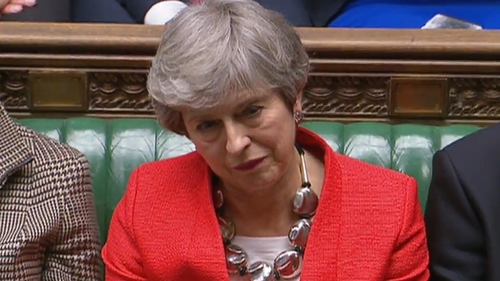 Prime Minister Theresa May badly lost a vote on her Brexit withdrawal agreement last night. Parliament will have a separate vote today on whether the UK should leave the European Union on March 29 without a deal. May has given politicians in her party a free vote, and investors expect parliament will vote against a no-deal Brexit - which most economists say would cause significant harm to the economy. "There should be an overwhelming parliamentary majority to prevent a no-deal exit on March 29, which should lend some support to the pound," Morgan Stanley strategists said. The pound rose 1% to the day's high of $1.32, putting the currency more than half way between this week's lows of $1.2945 and its high of $1.3290. Sterling was also stronger against the euro, hitting 85.6 pence. But it was still below a 22-month peak of 84.755 pence touched on Monday before hopes for May's Brexit deal to pass were crushed. Gauges of expected market volatility in the British currency showed some early signs of settling after briefly spiking to their highest levels this year yesterday.